The Spremy Electric Tomato Strainer separates seeds and skin and will produce a smooth tomato puree. It is also can be put to use to make apple sauce. It employees a stainless steel hopper, cast iron spiral, and has a 1/4 HP motor. This machine is made for home use and is made in Italy. O.M.R.A tomato milling manufacturer has purchased die from Imperia to make this model. As of AUG 2013 OMRA is now producing the Spremy tomato machine. 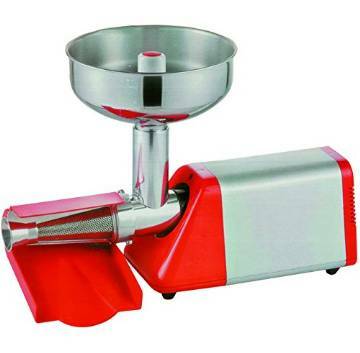 OPTIONAL FEATURES are available buy NOT INCLUDED - Additional attachments available: meat grinder; cheese grater. From dottie of clinton, Pennsylvania on 8/13/2018 . just received unit and only used it once but it worked great. so much better than doing everything by hand. assembly and cleanup are easy. we will be using several more times this summer to make more homeade sauce. very happy with our purchase.